The Derby High ‘Nature Ninjas’ put up a good fight in the final of the RHS Green ‘Plan it’ Challenge at the Whitworth Art Gallery in Manchester. 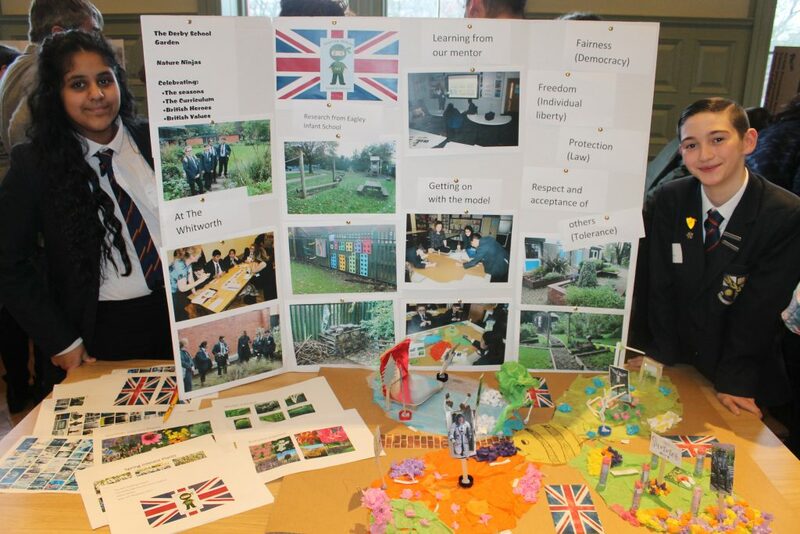 Their concept was amazing; a garden based on the four seasons, in four sections, each presenting a curriculum area, with four British heroes, promoting the four British values. Mo Farah represented sport, Tim Peake was the science section, L.S Lowry for visual art, whilst performing arts had the ice queen and Britannia, as this was linked to Winter. Their dynamic presentation wowed the judges who grilled our two representatives on every aspect of the garden for almost 15 minutes! Three key prizes were up for grabs; teamwork, innovation and the overall prize. The team nervously held their breath as the innovation prize was announced but sadly for the Ninjas this was a battle they did not win. Our two representatives had given a fabulous account of themselves and were great ambassadors for the school. This had been a fantastic project and the day has left a lasting impression on our year 8 team. See below: Zonish Mahmood and Owen Gardner display their concept.